King Gustavus Adolphus (1594-1632) ushered a new era into Sweden. He modernized the army, and through constant warfare, established Sweden as a respected and powerful empire. King Adolphus also modernized his administration, reorganizing the parishes for easier taxation and conscription. In modernizing his administration, the king also needed an efficient and prominent administration center. Stockholm’s earliest urban plan was a long-term trajectory for creating a modern European capitol; a shorter term venture with almost immediate effect was the modernization of the Skeppsbron Waterfront, begun in 1630. Even today, the Skeppsbron Waterfront is the iconic image of Stockholm. It is printed on tourist t-shirts, mugs and posters; it is also the title image of this blog. Today, like 1630, this waterfront is what the visitor first sees when arriving to Stockholm by water. Before King Adolphus’s modernization, this waterfront was a disorganized wharf teeming with activity. The king wanted a more modern, a more organized, and a more impressive and prosperous view to greet visitors. 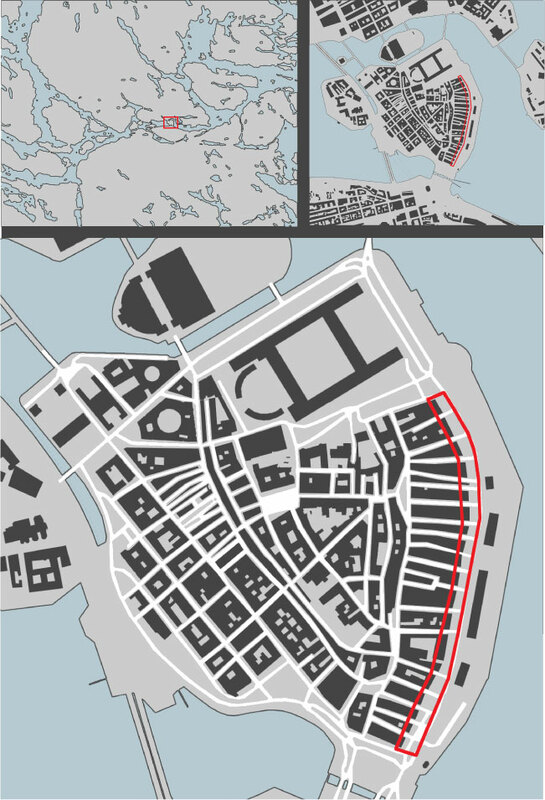 The king’s original plans called for the razing and modernization of much of Gamla Stan; luckily for us, only the waterfront was flattened and reorganized, leaving the interior of Gamla Stan a magical district where it is still possible to experience the medieval character of Stockholm. We do not have the original document that planned the modernization of the Skeppsbron Waterfront, so we do not know the exact regulations that directed the development. However, the result is clear. Large, prominent, “modern” buildings cap each block and face the waterfront, effectively hiding the medieval “old fashioned” neighborhoods of the interior of the island from an approaching boat. These new buildings were privately financed, designed, and constructed. 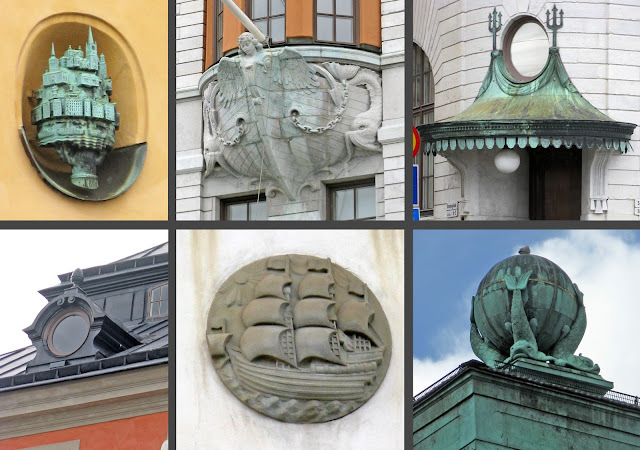 While there are unifying elements including a Renaissance-inspired style, the large scale of the buildings, the high-pitched roofs, the marine-inspired motifs, and the tripartite vertical division of the building facades, there is much stylistic variation among the buildings. 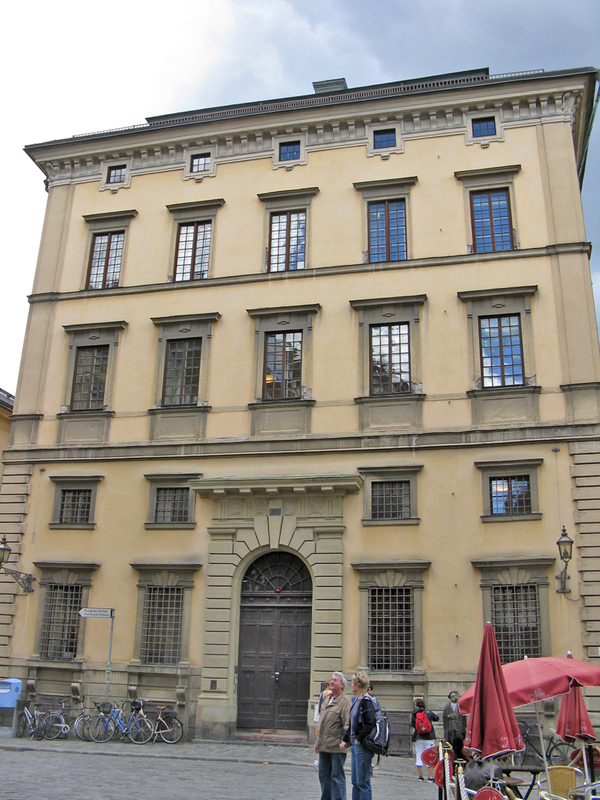 One of the more famous buildings on the Skeppsbron waterfront is the Southern National Bank Building designed by Nicodemus Tessin the Elder in 1675. 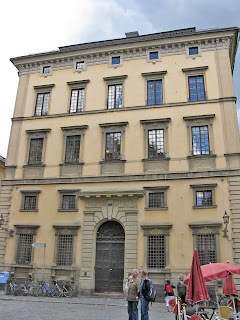 Tessin the Elder was a prominent figure in Swedish architecture; I’ll be writing more about him and his son (the Younger) soon. Like Stockholm’s first urban plan, the redevelopment of the Skeppsbron waterfront has had a permanent impact on Stockholm’s visual character and on the ambience of the city. The waterfront is now the essential icon of Stockholm as a watery city. The original Gamla Stan was enclosed by a protective wall, but the new Skeppsbron waterfront opened the city of Stockholm to Europe, embracing and impressing visitors for nearly 400 years.